Going to The Big Up Festival? Win VIP Upgrade Tickets Here! Planning on hitting The Big Up Festival at the end of this month to see over 50 bands (see complete lineup here) perform? If the answer is yes‚ here's your chance to do The Big Up Festival in style by winning a pair of VIP Upgrade tickets (selling for $200/each). Just fill out the form below -- we will choose the winner on July 20th. 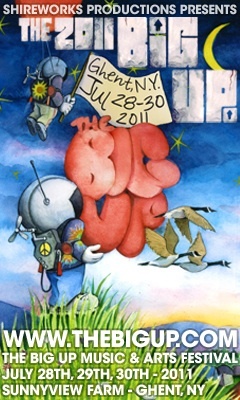 The Big Up Festival will take place on July 28-30 in Ghent‚ NY (less than an hour from Albany‚ less than three hours from Boston and NYC) and will feature EOTO‚ Tipper‚ Big Gigantic‚ RAQ‚ OTT‚ Marco Benevento‚ Higher Organix (all three nights) and many‚ many more.